Egypt and Ethiopia have some of the fastest growing populations in the world. Both countries went from 20 million in the 1950s to 80 million now and 150 million inhabitants in the near future. Almost all these people depend on from the Nile for their surival. The previous Egyptian Water Minister even threatened with a water war, should Ethiopia build a dam in the Nile. The struggle for survival has begun. Vinay Shekar has a problem. The 28-year old Indian should be working the 11.790 hectares of land in Bako, a remote area in western Ethiopia, which his company, Karuturi PLC has leased from the Ethiopian government. But things are not going as planned. The local cattle farmers have started a revolt against Karuturi. “They don´t want to leave our lands which they use for cattle grazing”, says the exasperated South Indian. “But the land is ours now. We want to grow rice here.” Shekar wipes the sweat from his face. It`s hot, here in the middle of nowhere. Indeed the Ethiopian government leased the land to the Indian company for 49 years. Further west, along the border with Sudan, Karuturi even leased an incredible 300.000 hectares of land. According to unconfirmed sources, Karuturi pays less than a Dollar per hectare per year. 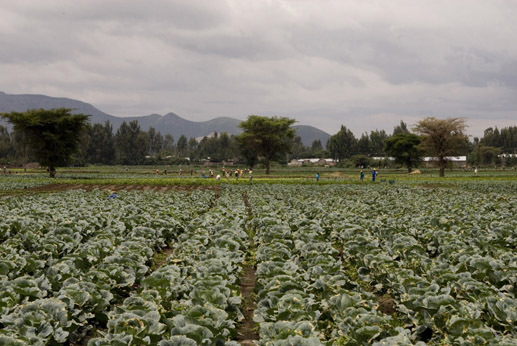 Since a few years, foreign investors such as Karuturi are invading Ethiopia. The Chinese construct roads; the Dutch grow roses and Indians and Saoudis have invested billions of Dollars in sugar-, corn-, palmoil- and rice plantations. The Ethiopian government leases out millions of hectares of fertile land, mostly in the western part of the country, which is part of the Nile basin. The idea behind the land leasing: increased food production; job creation and development of remote corners of the country. Farmers Vinay Shekar (l) and Mohammed Waeer (r) in Ethiopia and Egypt. (Photos: Célia Pernot (l), Ronald de Hommel (r). 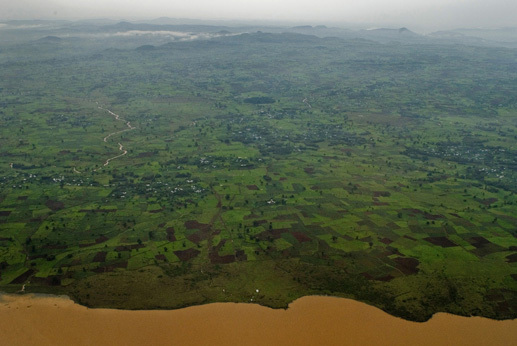 On the Ethiopian highland plateau at an altitude of roughly 2000 metres, annual monsoon rains form lake Tana, which is seen as the source of the Blue Nile. This river joins the White Nile in the Sudanese capital Khartoum. But just before the Sudanese border on a remote stretch of the Blue Nile deep in the Ethiopian jungle one of the most controversial developments in Eastern Africa is proceeding steadily: the building of Ethiopia`s Grand Renaissance Dam. It will be the largest hydropower plant in Africa when completed. “We need hydropower”, says Tsegaye Abebe, a member of the National Committee for the Grand Renaissance Dam. Ethiopia suffers from frequent electricity blackouts and badly needs the income generated by the export of electricity. The construction of the dam should be completed in 2016, according to Abebe. Egypt and Sudan fiercely oppose the dam. Their argumentation: according to Nile Treaties from 1929 and 1959, Egypt and Sudan are entitled to receive 80% of all Nile water. With their exploding populations and their economies growing, both downstream countries experience an ever-increasing demand for water, and fear that Ethiopia will take it away from them. Abdel Geber Regab and his son on the low dyke that separates their field from the Nile. (Photo: Ronald de Hommel).